Where dataset1 and dataset2 are GenomicDatasets. If you used the ADAMContext to read a genomic dataset into memory, this condition is met. A subset of these joins are depicted below. This query joins a genomic dataset of Genotypes against a genomic dataset of Features using an inner join. Because this is an inner join, records from either dataset that do not pair to the other are automatically dropped, providing the filter we are interested in. This query is useful for trying to identify genotypes that overlap features of interest. For example, if our feature file contains all the exonic regions of the genome, this query would extract all genotypes that fall in exonic regions. This query joins a genomic dataset of Variants against a genomic dataset of Features, and immediately performs a group-by on the Feature. This produces a genomic dataset whose elements are a tuple containing a Feature, and all of the Variants overlapping the Feature. This produces an RDD whose elements are tuples containing a Feature and all of the Variants overlapping the Feature. 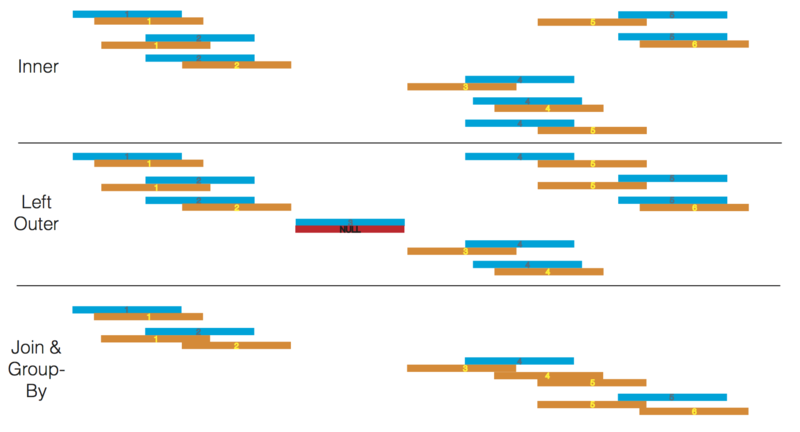 This query is useful for trying to identify annotated variants that may interact (identifying frameshift mutations within a transcript that may act as a pair to shift and then restore the reading frame) or as the start of a query that computes variant density over a set of genomic features. This query joins a genomic dataset of reads with a genomic dataset of features using an outer join. The outer join will produce an RDD where each read is optionally mapped to a feature. If a given read does not overlap with any features provided, it is paired with a None. After we perform the join, we use a predicate to separate the reads into two RDDs. This query is useful for filtering out reads based on feature data. For example, identifying reads that overlap with ATAC-seq data to perform chromatin accessibility studies. It may be useful to separate the reads to perform distinct analyses on each resulting dataset.